Knit with 100% super fine alpaca yarn and lined with soft fleece, this hooded scarf keeps your core warm and looking good. The wool is harvested and spun by Peru’s sustainable alpaca network, then woven to its chunky, soft finish at a B-corporation artisan mill in Colorado, USA—even its buttons are made in Maine from sustainably harvested wood. 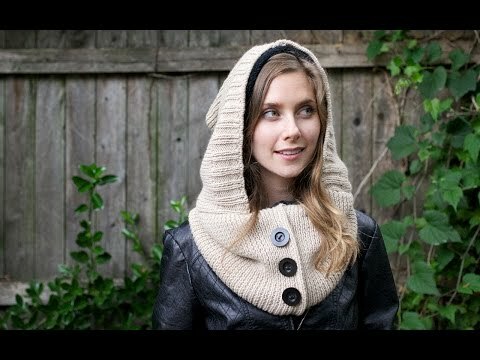 Wear it draped like a cowl scarf or seamlessly step outside and feel bundled. Very good quality, and very happy with my new hoodie. Knitted in an antique mill in the Colorado Rockies, these hooded scarfs weave together soft, super fine Alpaca and Merino wool in a lush, comfy design. Maker Avi Loren Fox is committed to creating something beautiful that also upholds high standards of social and environmental transparency—from the B-corporation manufacturing down to the sustainably sourced wood for the buttons. Seamlessly hood up to step outside, or wear Wild Mantle draped like a cowl scarf indoors. The chunky knit material keeps your core warm and doubles as a cute accessory when you’re inside. Besides looking good and feeling bundled, you’ll be supporting a company that sincerely cares about the environment and the people it employs.